Yellow or white gold, monochromatic and pavé diamonds, the Quatre Radiant line is undoubtedly the most graphic of all Quatre collections. 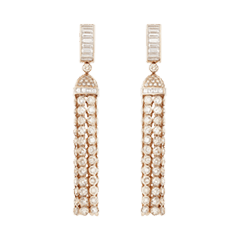 Its proportions, style and simple lines are a subtle reminder of the esthetic codes of classic architecture, which was one of Fréderic Boucheron’s favorite sources of inspiration. 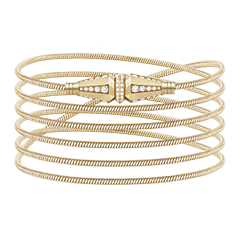 Quatre Radiant Edition Bangle Bracelet Bangle bracelet set with pavé diamonds in white gold and yellow gold. 120 years ago, Frédéric Boucheron selected the private mansion or Hôtel Particulier at 26 Place Vendôme for its ideal location and the incredible light that shine onto it all day long. Today, the Radiant Edition line, is declined in the form of a Bangle bracelet. Its finesse and delicateness are enhanced by its diamonds line that reflect daylight and its Grosgrain motif. This bracelet adds the perfect touch to a woman with modern and confident style. Quatre Radiant Edition Cuff Bracelet Cuff bracelet set with pavé diamonds, in white gold. This cuff offers a surprising and modern new interpretation of the Quatre symbolic codes. Quatre's strong design, made of sculpted, graphic lines comes to life thanks to the Hands of Light who reproduce the collection's mythical visual codes on an open-work structure set with pavé diamonds. The piece's open-work allows the light to shine in and offer the confort of a second skin. Quatre Radiant Edition Cuff Bracelet Cuff bracelet set with pavé brown diamonds, in pink gold. 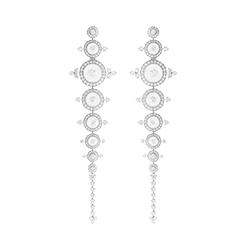 122 years ago, Frédéric Boucheron selected the Hôtel Particulier at 26 Place Vendôme for its ideal location and the incredible light that shine onto it all day long. Today, the Radiant Edition line, is declined in the form of a long necklace. Its finesse and delicateness are enhanced by its Quatre Radiant mini rings and its yellow gold chains delicately adorned with diamonds. 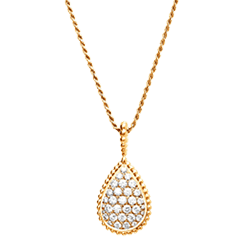 This long necklace reflects all the daylight and adds the perfect touch to a woman with elegant and confident style. 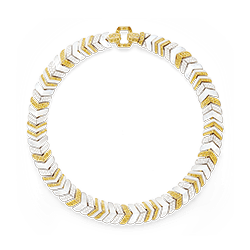 Today, the Radiant Edition line, is declined in the form of a bangle bracelet. Its finesse and delicateness are enhanced by its diamond line that reflect daylight and its grosgrain motif. This bracelet adds the perfect touch to a woman with modern and confident style. 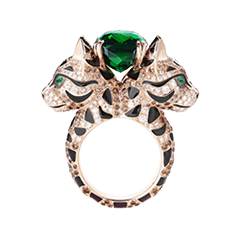 The iconic Quatre ring is adorned with diamonds in this High Jewelry version. 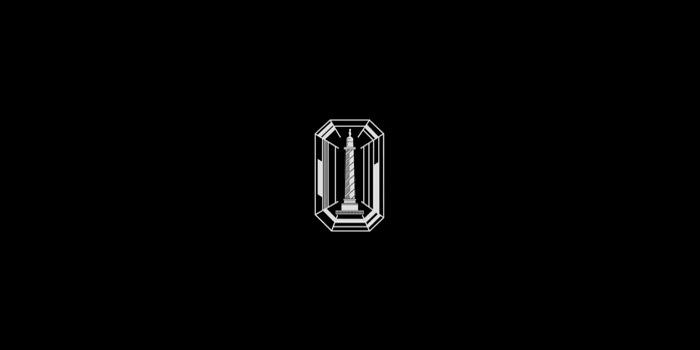 Jeweler codes are reinterpreted with diamonds: gadroons become baguette-cut diamonds, clous de Paris become princess-cut diamonds, and double gadroons become a mirror setting. This high jewelry interpretation provides a newfound strength to the ring. The timeless Classique is the highlight of the Quatre collection. 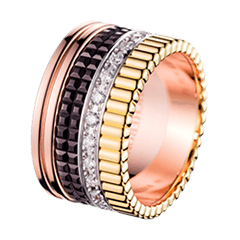 This unique and out-of-time ring features both the avant-gardism and innovation of the Maison Boucheron. The four rings of Quatre Classique are undeniable icons of modernism that combine yellow, white, and pink gold as well as brown PVD, which is very unusual in jewelry. 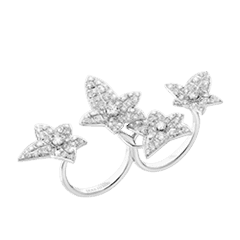 The delicate pavé diamonds bring a bright radiance to this exceptional piece. Quatre Classique is today one of Maison Boucheron’s signature collections and features a delicate matching chain set off by 8 mini Quatre rings that perfectly balance this rose gold ensemble. The diamonds catch the light at every angle, bringing out the creation’s elegant, bold look to perfection. 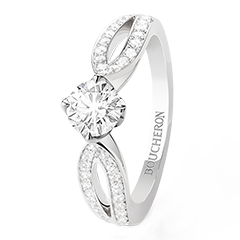 The Maison Boucheron’s iconic codes are constantly re-interpreted in this collection which embodies the excellence of the craftsman and gold sculptor. 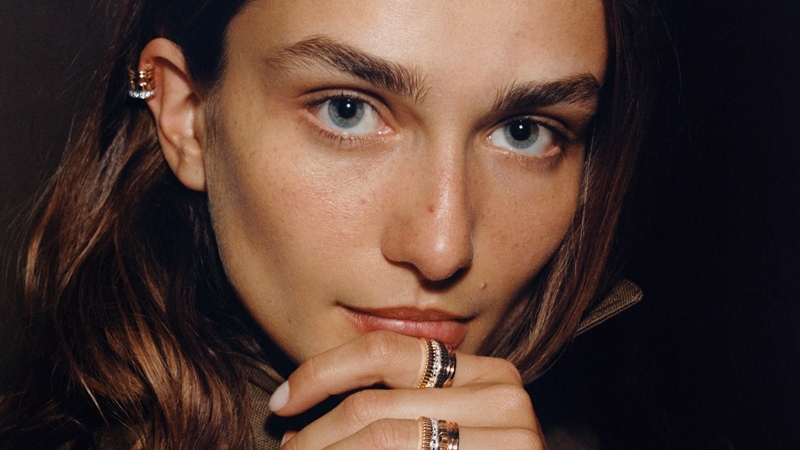 These modern and boldly designed jewels offer a distinctively striking combination of golds and textures.